If you are a woman, you must be aware of the importance that jewelry holds, in adding to your inherent beauty. It is one of the best accessories that almost every woman swears by. Since a piece of jewelry can easily make or mar your outfit, it is necessary to have versatile pieces in hand. While many women manage to create a good collection of jewelry, very few of them are able to organize it in a proper way. And unless you arrange your jewelry in proper categories, you will not be able to make full use of it. There will always be one or the other items that will escape your notice. 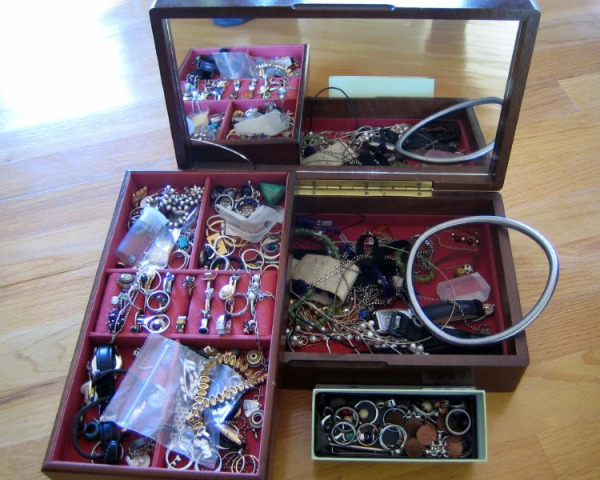 Avoid this chance by checking out the tips given below, on how to organize your jewelry. The best way to organize your jewelry collection is to make use of jewelry boxes. They not only help you keep the items properly categorized, but also save them from the usual wear and tear. You can also keep two jewelry boxes, one for storing precious items and the other for cosmetic and fashion jewelry. The next step will comprise of sorting out your jewelry, first into precious and cosmetic jewelry. During this time, make a separate pile of all those items that you do not use and one for the broken pieces, which you may either get repaired or decide to simply throw away. Divide the precious jewelry by type, with separate piles for rings, earrings, necklaces and bracelets. This will help you know the size of jewelry box that you would require as well as the amount and size of sections needed therein. Make sure to keep a miscellaneous section as well. Now, repeat the same step with the cosmetic jewelry. Now, you need to go to the market and buy two jewelry boxes, one for precious jewelry and one for cosmetic jewelry. Make sure that the boxes have a fabric lining, to prevent scratching of your jewelry. Remember that, if used to its full potential, a jewelry box can really help you keep all your jewelry sorted out and use it to the maximum possible extent. Before you place your jewelry inside the box, it is very necessary to clean it thoroughly. Use silver polish or a jeweler's cloth to clean silver jewelry and a solution of warm water and dishwashing liquid, for gold (wipe it dry with lint-free cloth or chamois). As for the cosmetic jewelry, just use a toothbrush and some cleaning liquid to clean them up and wipe dry. Start with jewelry organization. Keep the necklaces in the biggest section of your jewelry box. While laying them down, be a bit careful, so as not to damage them. At the same time, do not place them haphazardly; otherwise you will get rewarded with unwanted kinks in chains and tangling. Thereafter, place the bracelets in a smaller section. Now is the time to make use of the smallest compartments of the jewelry box, for the purpose of storing earrings and rings. Though these items do not take much space, make sure not to cram them up in a compartment that is too small. Finally, use a deep, medium-sized compartment for storing miscellaneous items. Your jewelry is now organized properly.